Posted on December 29, 2018 by K. A.
Dimensions: 25 x 20.5 cm. 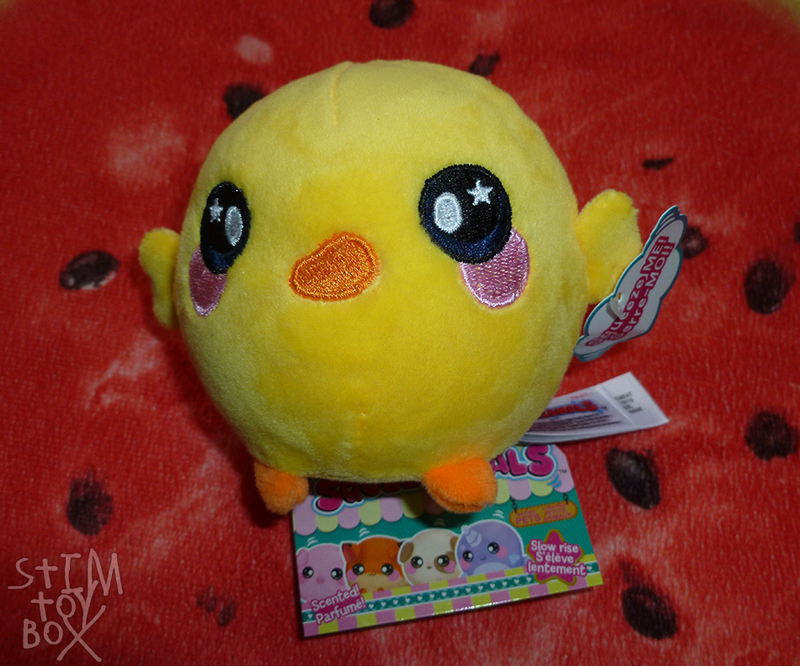 I found this on clearance sale at my local store–marked down to $3 AUD from $9 AUD! I don’t know how many are still left or how many stores have them, but I think it’s worth a look for this price! Unfortunately, the bag isn’t quite big enough to hold my iPad or a 7 inch tablet, but it does hold my old Sony Reader and 5th Gen Kindle (screen size for both approximately 6 inches). 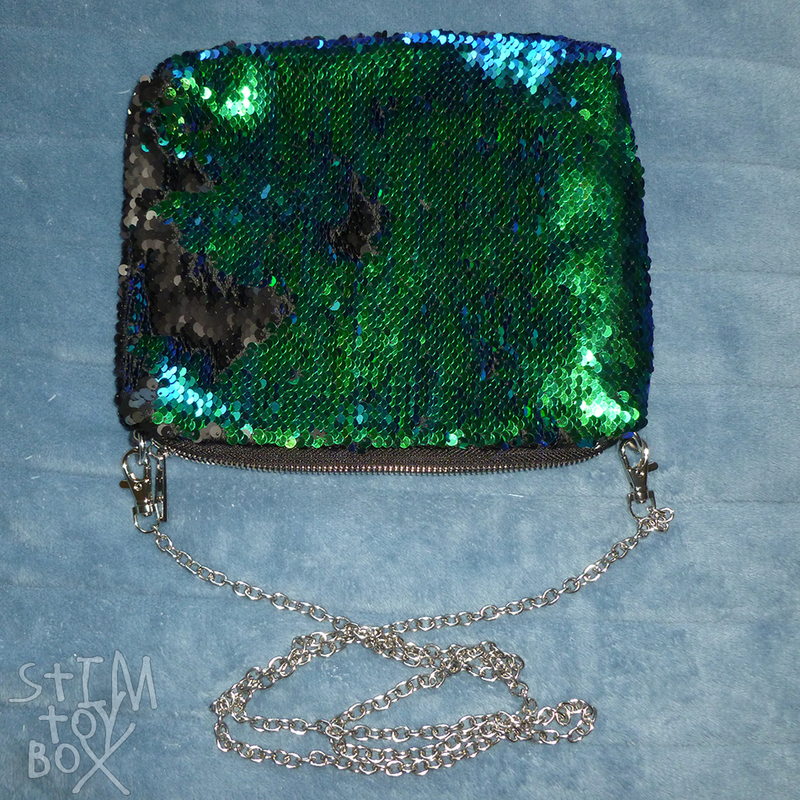 It’s much deeper than most mermaid sequin pencil cases, too, so if you’re wanting a bigger pencil case for markers or stim toys, I recommend this–as someone with a fairly diverse stim kit, I don’t find that the smaller K-Mart mermaid sequin pouches fit all the toys I wish to travel with. This does, easily. Inside the bag, there’s a small zip pouch and a small fold-out pocket for a phone, useful both for use as a purse and for organising smaller stim toys. I wish it were a bit more colourful (imagine this bag in rainbow sequins, right?) but other than that, I think this bag is absolutely brilliant in terms of size and varied utility. Originally posted on @stimtoybox on October 15, 2018. Posted on December 27, 2018 by K. A. Variations: blue, pink, purple, green, black. 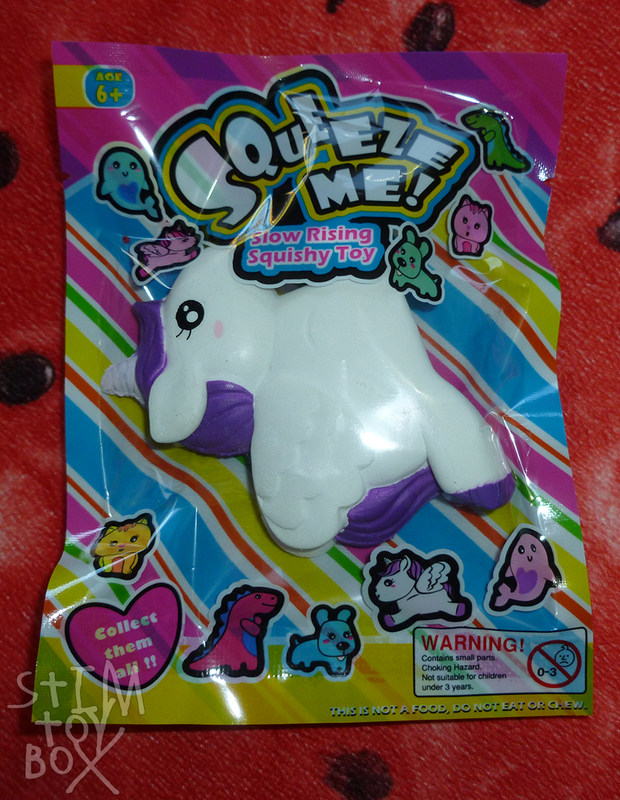 I found these in the clearance section of the Smiggle store in Melbourne Central at 5 for $5 AUD, so I recommend checking your local store before ordering these online! I’ve had a few of these maze-style stim toys before: I’ve got a rectangle maze from Daiso and a cube maze (that’s also a tiny self-inking stamp) from a dollar shop. I find them quite hard to use, as they require very precise turns of the maze toy to direct the balls. I rarely have the ability to make these subtle movements, meaning the balls go everywhere but where I want them, making for a frustrating stim. I like them better in theory than in practice. 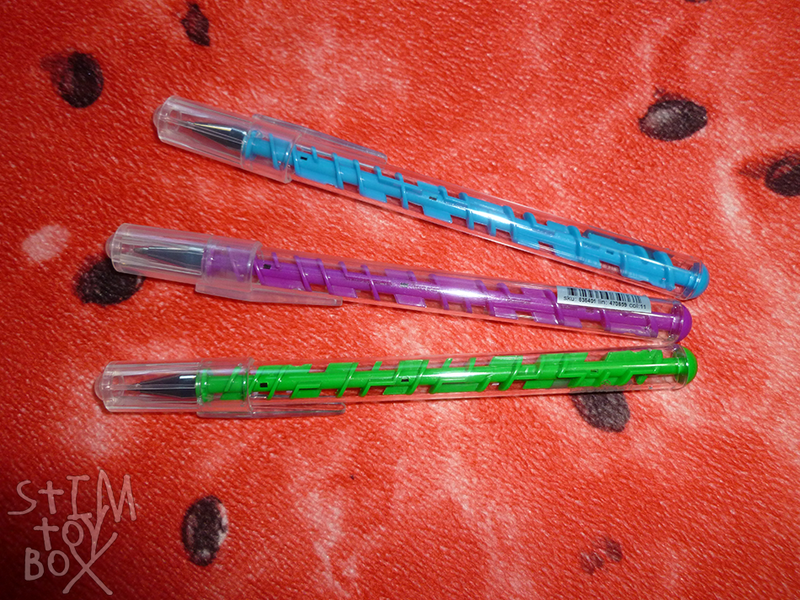 Because these are pens, resulting in a less-complicated maze, they’re so much easier to use. There’s fewer dead-ends to catch the balls and fewer mistakes to make in turning the pen so the balls go the right way. There’s just enough dead ends to catch me but not so many to make navigating the balls impossible. The rounded shape of the pen, too, is easier for me to turn and tilt. This isn’t as engaging as a Tangle or a squishy in terms of longer stimming, but as a break between toys it works for me, plus it also works decently as a pen. For folks who struggle to grip things, the pen’s being so much wider than a traditional ball-point makes it easier to use, too, so it has utility as well as stim. The only drawback to these is that they do rattle. I’ve got one in my main stim basket and another in my travelling kit, but I do hear them move if they bounce around in my bag. They’re not a silent toy to use around other people and can distract others in the classroom or library. This said, the rattle may be a feature, not a drawback, for many stimmers! 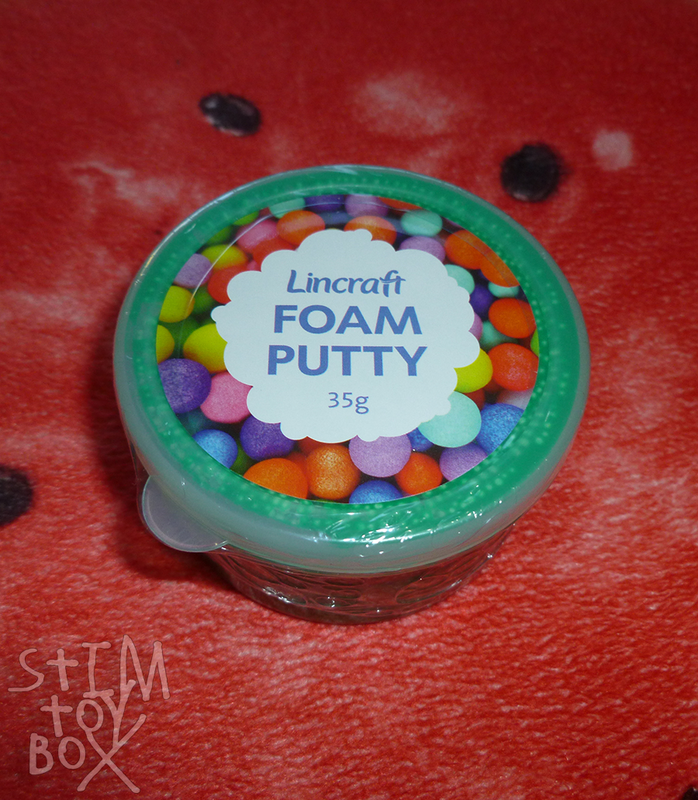 If you want a maze-style stim toy, though, that isn’t too hard to use, this. I absolutely love mine. Originally posted on @stimtoybox on August 24, 2018. Posted on December 25, 2018 by K. A.
Dimensions: 18 x 11 cm. 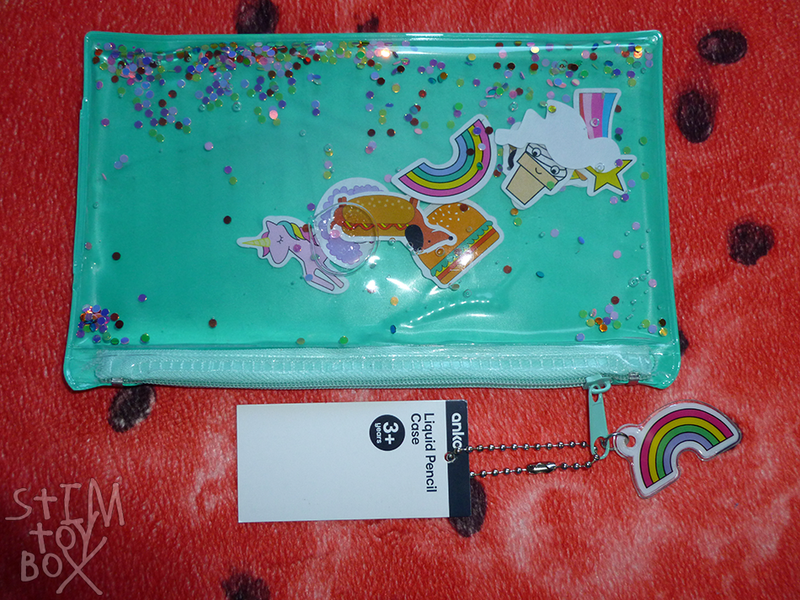 This is another liquid or gel-filled pencil case with a front pocket filled with gel, glitter and paper-style images of cute objects. I do feel that this is slightly overpriced, but the gel inside the front pocket of the pencil case is very nice to squish. It also retains coolness very well, for folks who like handing cold toys or having a cold temperature element in their stimming–if you leave it in a cool room, or perhaps even the fridge for short periods of time, the pencil case becomes quite cold to the touch and takes a decent amount of handling to warm up. I actually find it a little too good at remaining cold, at least in the winter–even with the heater going in my room, the case is much cooler to the touch than my desk and keyboard. I will say that as a squish toy, which is how I’ve been using this case, it works best without pencils or anything else inside. I can easily just push the paper images and glitter about the case without anything hard underneath. If you just want to turn it about for the movement of the glitter, it’ll work as a pencil case (or for smaller stim toys) but I find this detracts from the squishability of the gel filler. Unlike mermaid sequin pouches, I’m not using this for storage. Because it’s entirely plastic, it may work for storing chewables, but I wouldn’t zip the case entirely closed if so. I do recommend checking your case thoroughly to make sure all the paper images are turned the right way. My flamingo image is backwards and it does annoy me a little bit! Originally posted on @stimtoybox on August 31, 2018. Posted on December 24, 2018 by K. A.
Dimensions: 10 x 10 x 11 cm at highest point. Bodero is a clearance-style discount store. I know there’s stores in Victoria, Australia (and a few come up when I do a Google search) but there’s no website listing all the stores or the products. They often have beauty and homeware type items, but I’ve found storage containers, bathmats and a few odd fidget toys. Yesterday, I found these jumbo-sized scroll squishies for $1 AUD each. $1! That’s better than eBay for something this size! These squishes are a little denser than most squishies. They’re not stress-ball dense, but they don’t have the nice fluffy-marshmallow texture of a really melty soft squishy. The texture, between the dripping icing, the raised section of the scroll and the dimpling is fantastic for stroking. I opened two: one of them is quite slow rising, but the other is only moderately so; expect some variation in rise and softness. Both have a tiny hole in the top of the squishy, meaning they make that lovely whistling noise when pressed for additional auditory stimming. What makes these amazing (aside from the price) is that they’re almost completely odourless. There is no added scent. I smell a faint chemical-plastic scent from the foam when held right under my nose, but there is absolutely zero added smell. (I suspect the chemical smell will fade once these have aired, but it’s very slight as is.) These will be perfect to use in public or around folks who need to avoid strong fragrances, and they leave no scent on my hands. The only drawback for these is that they look realistic enough that I’d be careful with them around pets and small children. 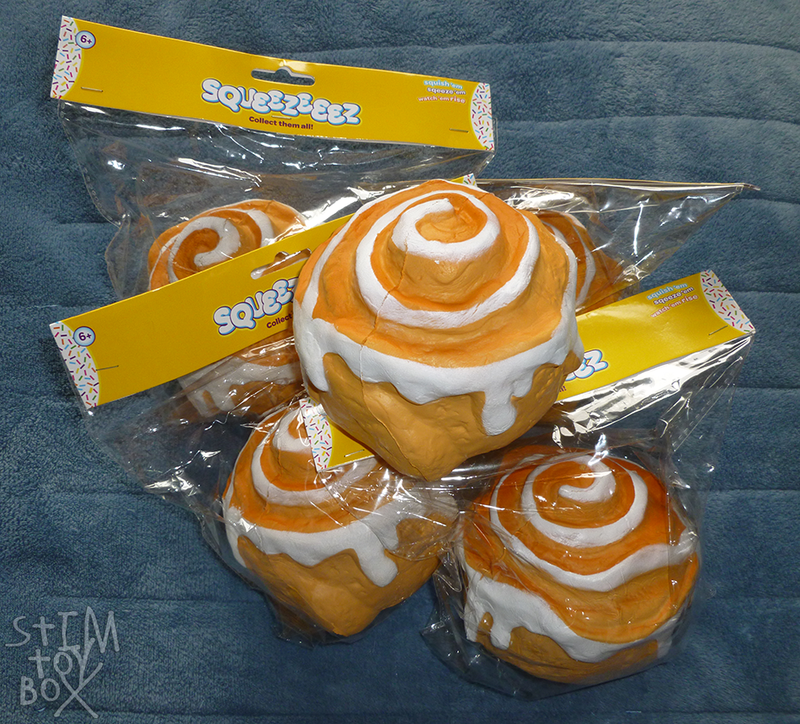 They’re larger than the average scroll cake, but not so much that they couldn’t be mistaken for one. Originally posted on @stimtoybox on November 13, 2018.